Kasetsart University (Thai: มหาวิทยาลัยเกษตรศาสตร์; RTGS: Mahawitthayalai Kasetsat) (KU) is a public research university in Bangkok, Thailand. It was Thailand's first agricultural university and Thailand's third oldest university. It was established on 2 February 1943 to promote subjects related to agricultural science. Since then, Kasetsart University has expanded its subject areas to cover life sciences, science, engineering, social sciences, and humanities. Kasetsart University's main campus is in Bangkhen, northern Bangkok, with several other campuses throughout Thailand. It is the largest university in Thailand. 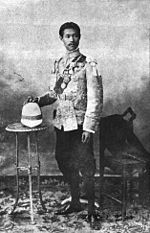 In 1902, King Chulalongkorn attempted to promote the country's silk, silverware, and weaving industries. He hired Dr Kametaro Toyama, from the University of Tokyo, to train Siamese students in Japanese silk and weaving crafts. In 1904, the School of Sericulture was founded at Tambon Thung Saladaeng, Bangkok by Prince Benbadhanabongse, the Director of the Department of Sericulture of the Ministry of Agriculture. The school was renamed the School of Agriculture in 1906. In 1908, the School of the Ministry of Agriculture was founded at Windsor Palace as the Ministry of Agriculture merged three schools, the School of Surveying (founded in 1882), the School of Irrigation (founded in 1905), and the School of Agriculture. Thailand's first tertiary-level agriculture curriculum began to offer courses in 1909. In 1917, Phraya Thepsartsatit and Chaophraya Thammasakmontri of the Ministry of Education founded the first primary school of agriculture under the Ministry of Agriculture, named the Primary School Agriculture Teacher Training School in Tambon Horwang. It moved to Tambon Phra Prathon, Nakhon Pathom Province in 1918. In 1931, Prince Sithiporn Kridakara and Chaophraya Thammasakmontri together expanded the school regionally. In the central region, a campus was located in Saraburi Province, in the northern region in Chiang Mai Province, in the northeastern region in Nakhon Ratchasima Province, and in the southern region in Songkhla Province. In 1935, the Primary School Agriculture Teacher Training School in each part of the country was closed and merged following the agricultural education policy in that time. Luang Ingkhasikasikan, Luang Suwan Vajokkasikij, and Phra Chuangkasetsinlapakan together proposed to maintain the Mae Jo School (today's Mae Jo University) at Chiang Mai Province only and renamed it Secondary-level Agriculture Technical School before it was elevated to the College of Agriculture, under the Department of Agriculture and Fisheries. The Ministry of Agriculture established the Central Agriculture Station or "Kaset Klang", in Bang Khen District, Bangkok. It caused the College of Agriculture to move to Bang Khen District in 1938 and the government office at Chiang Mai Province became Kasetsart Preparatory School to prepare students to study at the College of Agriculture in Bang Khen. In 1943, Field Marshal Plaek Phibunsongkhram promoted the College of Agriculture and established Kasetsart University as a department of the Ministry of Agriculture. The university consisted of four faculties: agriculture, fisheries, forestry, and cooperatives (today's Faculty of Economics and Faculty of Business Administration). In 1966, Mom Luang Xujati Kambhu, the Fifth President of Kasetsart University, judged the Bang Khen campus too confined and unable to support the education in agricultural sciences called for by the National Social and Economics Development Plan. The Kamphaeng Saen campus was established on 12 November 1979 as a result. The university further expanded by establishing Si Racha campus, Chalermphrakiat Sakon Nakhon Province campus, Suphan Buri campus, Krabi campus and Lopburi campus. The university already established Si Racha campus in 1989 and the Chalermphrakiat Sakon Nakhon Province campus on 15 August 1996. On 18 July 2015, the Kasetsart University Act B.E. 2558 (2015) transformed it from a public university to a national university. Kasetsart University's symbol is Phra Phirun, the god of rain mounted on a Nāga with encircled by lotus petals and then by the words "มหาวิทยาลัยเกษตรศาสตร์ พ.ศ. ๒๔๘๖" in the Thai version and "KASETSART UNIVERSITY 1943" in the English version. The Nontri tree has been a symbol of Kasetsart University since 1963. The king and queen planted nine Nontri trees in the front of Kasetsart University's main auditorium on 29 November 1963 which became historic day for Nisit Kasetsart. The Nontri is a tree in the Fabaceae family. It is a long-lived evergreen with grey-brown bark with upright branches. The leaves are bipinnate compound and the flowers are yellow, produced in large compound racemes. Its fruit is a pod containing seeds. Kasetsart University occupies 846 rai (135 hectares) in Bangkok. The Kamphaeng Saen campus is the first and largest branch of Kasetsart University. The Sriracha campus was established in 1988, and occupies an area of 199 rai (32 hectares) in the Si Racha District of Chonburi Province. The QS World University Rankings 2019 ranked Kasetsart University 130th in Asia and 801-1000th in the world. In addition, the QS World University Rankings by Subject 2019, the university was ranked 51-100th in Agriculture & Forestry, 251-300th in Environmental Studies, 401-450th in Chemistry, 451-500th in Engineering - Mechanical, Aeronautical & Manufacturing and Business & Management Studies. Kasetsart was ranked 29th in Agriculture and Forestry worldwide in the QS World University Rankings 2017. It was ranked in the 651-700 tranche in the QS World University Rankings 2015–2016. The Times Higher Education World University Rankings 2017–2018 ranked Kasetsart University in the 800-1000 tier in the world and 251-300th in the BRICS and Emerging Economies. The Institute of Food Research and Product Development (IFRPD), is a science and food technology research institute, with the mandate to provide information and services to society as well as research in support of governmental policies to resolve the country's economic problems related to agricultural products. Kasetsart Agricultural and Agro-Industrial Product Improvement Institute (KAPI), is an agricultural and agro-industrial product research institute, established on 29 July 1991 to research and develop quality standards in non-food innovation. Kasetsart University Research and Development Institute (KURDI) administers and coordinates research projects and research efforts. Kasetsart University Institute for Advanced Studies (KUIAS) consists of four research centers: the Center for Advanced Studies for Agriculture and Food; the Center for Advanced Studies in Tropical Natural Resources; the Center for Advanced Studies in Nanotechnology for Chemical, Food and Agricultural Industries; and the Center for Advanced Studies In Industrial Technology. They are responsible for carrying out targeted research initiatives. Housed at Kasetsart University's Kamphaeng Saen Campus, the center is a provider of silkworm eggs and know-how to Thai farmers. Kasetsart University Student Council (KUSC) is a KU student organization as set out in the 1952 student constitution. Kasetsart University Student Administrative Board (KUSAB) represents KU student interests in academic, social, and recreational activities. HRH Princess Chulabhorn, a Thai princess who was awarded the UNESCO Albert Einstein medal for her efforts in promoting scientific collaboration in 1986. HSH Prince Sithiporn Kridakara, Thailand's "father of modern agriculture", was awarded the 1967 Ramon Magsaysay Award for public service for his efforts in the development of Thai agriculture. ^ "The University Administration". Kasetsart University. Retrieved 16 October 2015. ^ "Administration: Number of Personnel". Kasetsart University. Retrieved 19 October 2017. ^ "Total Students". Kasetsart University. Retrieved 19 October 2017. ^ a b "Kasetsart Symbol". Kasetsart University. Retrieved 29 August 2015. ^ "Kasetsart University". Top Universities. Retrieved 1 March 2019. ^ "Agriculture and Forestry University Rankings". ^ "QS World University Rankings 2015/16". QS Top Universities. Retrieved 21 November 2015. ^ "Kasetsart University World University Rankings". Times Higher Education. Retrieved 11 February 2018. ^ "Introduced organization". Institute of Food Research and Product Development. Retrieved 3 January 2017. ^ "About us". Kasetsart Agricultural and Agro-Industrial Product Improvement Institute. Retrieved 3 January 2017. ^ "Introduced organization". Kasetsart University Research and Development Institute. Archived from the original on 12 March 2017. Retrieved 10 March 2017. ^ "Kasetsart University Research". KU forest. Retrieved 4 January 2017. ^ "วันพฤหัสบดีที่ ๒๑ กรกฎาคม ๒๕๒๖". หอประวัติมหาวิทยาลัยเกษตรศาสตร์. Retrieved 2 January 2017. ^ "มก.ทูลเกล้าฯ ถวายปริญญาวิทยาศาสตรดุษฎีบัณฑิตกิตติมศักดิ์ สาขาสัตวศาสตร์ แด่ เจ้าชายอากิชิโน". Office of the Public Relations, Kasetsart University. Retrieved 2 January 2017. ^ "มก. จัดพิธีประสาทปริญญาปรัชญาดุษฎีบัณฑิตกิตติมศักดิ์ (เศรษฐศาสตร์)" (PDF). สำนักงานเลขานุการ คณะเศรษฐศาสตร์ มหาวิทยาลัยเกษตรศาสตร์. Retrieved 2 January 2017.